Some people are smart. Like “Jeopardy” smart, right? All kidding aside, everyone knows someone who would be their go-to first-pick for Trivial Pursuit. The depth and breadth of knowledge these intelligentsia possess is astounding . . . and Leonard Bernstein was one of their brightest stars. He could, and regularly did, talk for hours about an endless array of topics from music, to poetry, to life in general. In his latest release, Dinner with Lenny: The Last Long Interview with Leonard Bernstein, Jonathan Cott was actually lucky enough to get to sit down and chat with The Maestro over an almost 12-hour period. It was only supposed to be a simple dinner, but somehow time slipped away from the pair as they chatted. Initially, the result of this meeting was to be an article for Rolling Stone. 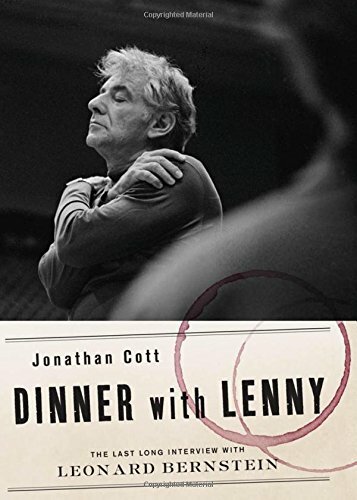 But in standard fashion, Lenny (Bernstein lets all his close, personal friends call him Lenny) was so effusive and eloquent, that Mr. Cott easily had enough material for this book. Dinner with Lenny is surprisingly captivating. As a jaded reader, one expects all these conversational books to sound the same. But there is something charming about the dialogue between the two men that makes the reader want to keep reading. This interview occurred in November 1989, a mere year before Bernstein’s death. As a Jew, Bernstein would undoubtedly love being compared to one of “the old men who dream dreams” from the Old Testament (in Joel). Lenny had traveled far and accomplished much in his tenure. All this experience gave him a unique perspective from which to ponder and share a remarkable life. The only complaint with Mr. Cott’s work is that sometimes the author interjects too much of himself into the conversation. It is impossible to imagine the intimidation factor when sitting face to face with The Maestro himself. Therefore, it is somewhat understandable that the author would want to show Bernstein that he had done his homework because Lenny was never one to suffer fools lightly. Unfortunately, sometimes this can come across like an overeager student trying to impress a popular teacher. If he were younger, Mr. Cott might need to worry about a retributive wedgie. Leonard Bernstein was a tough but undeniably brilliant man. Very few individuals burrow deep into the nuances of the world and really grasp at the meanings of life, of love, and most definitely of music. Lenny certainly did not have all the answers, but from the conversation recorded here it seems like he loved nothing more than trying to find them. And we are better because he did.